Japanese candlestick charts have become a staple trading tool since a long time ago. An Introduction to Japanese Candlestick Charting had been written by Erik Gebhard of Altavest quite some time before that (in the year 2000). Nevertheless, this e-book can still serve as a primer for newbie traders on the Japanese candles and on the patterns based on them. Explanation of what is Japanese candlestick chart and how it is better than the traditional bar chart. Description of the popular single-candle patterns. List of the reversal patterns based on one or two candlesticks. Overview of the star formations. A good concluding section showing a clear way for further study and learning (Steve Nison‘s books). Traders fluent in Japanese candlesticks can safely ignore this introductory e-book. But if you are new to the concept, it is one the best places you could start your education on this charting method. 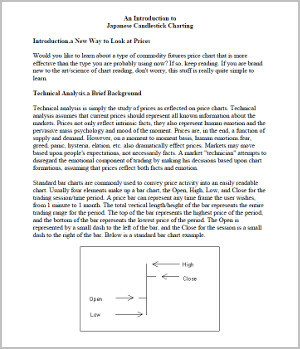 If you have any questions, comments or opinions regarding An Introduction to Japanese Candlestick Charting by Erik Gebhard, please feel free to post them using the commentary form below.